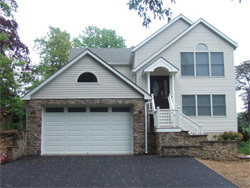 Hutchinson Construction began in 2008 remodeling bathrooms, kitchens and constructing home additions in the Pasadena, Severna Park, and Arnold areas of Maryland. Led by Mark Hutchinson, a General Contractor with 25 years experience in designing and building homes, Hutchinson Construction is a member of the NFIB (National Federation of Independent Businesses). Why do clients work with Hutchinson Construction? We work with our clients through the entire renovation process, explaining to them exactly what they will go through, give them a detailed cost breakdown as well as a schedule for when work will be completed. Of course, hiccups always occur throughout nearly every project, however our experience gives us the ability to quickly troubleshoot any problems and provide a high quality renovation that finishes on time, and within budget. Letting a stranger in to your home to completely demolish a working kitchen and replace it with a brand new one takes a good deal of trust. We appreciate that while remodeling or adding on to your home is an exciting endeavor, it can also be very intimidating and a tough decision to make. We will walk you through the entire renovation process so you know what to expect and how the project will work. That is what we try and bring to every job we work on, that "Wow Factor." We want to make sure that your new kitchen, bathroom, bedroom, or family room is the one of your dreams. Hutchinson Construction does not partner with a particular manufacturer or designer. Your design can be custom tailored to your exact needs and budget. Top of the line marble, large Jacuzzi tub, or wet bar, we will work with you to pick out the materials that you want and install them. Hutchinson Construction handles your entire renovation project from obtaining the proper permits and zoning to polishing the finished product, your trust in Hutchinson Construction gives you a worry free renovation process. Any subcontractors that we bring in, whether to do plumbing, electricity, or build a roof, is well vetted out and performs all work to 100% satisfaction. View samples of our kitchen, bathroom, and addition renovations.